Simplicity at its best, this stew benefits from very slow cooking, which makes the lamb butter-tender and melting off the bone. Ask your butcher to cut the lamb into even-sized pieces. Heat the olive oil in a Dutch oven over medium-high heat. Generously season the lamb with salt and pepper. Add just enough lamb to cover the bottom of the pot and brown on each side, about 10 minutes each. 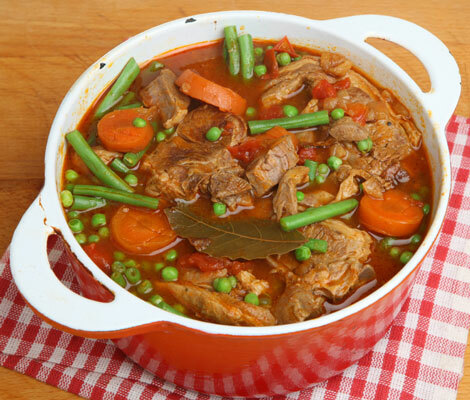 Remove the cooked meat to a large dish and brown the remaining lamb in batches. Return all the cooked meat and any accumulated juices to the pot. Add the onion, garlic, and thyme and cook until the onion is soft. Add the bay leaf and water. Bring to a boil, scraping the bottom of the pot to remove any cooked-on particles. Cover and simmer for 1-1⁄2 hours, or until the meat is tender. Add the carrots and cook, covered, for 30 minutes. Add the peas and cook, covered, 20 minutes longer. Taste and, if necessary, season with salt and pepper before serving.